Happy Wednesday, everyone!! 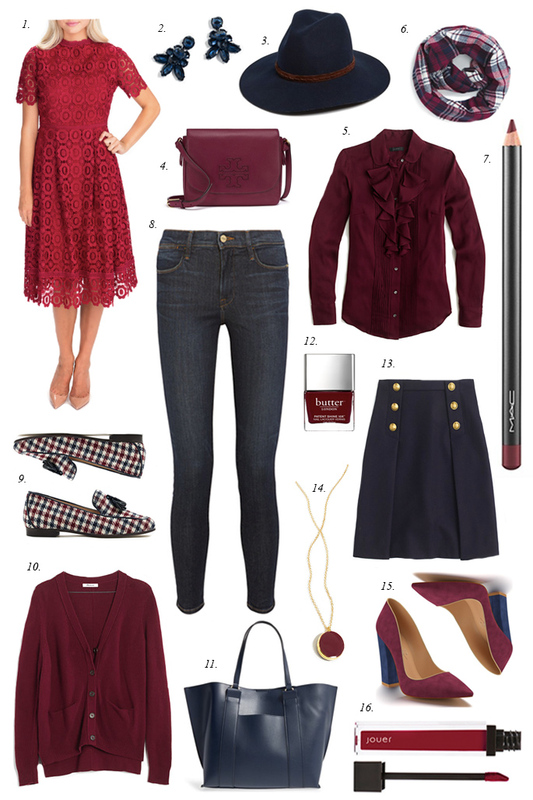 Bordeaux and navy are two colors I’m really excited to wear this fall. They are both gorgeous, rich jewel tones that be worn on their own or together! And this dress (#1) from my clothing line is currently available for pre-order! It’s an absolute must have for this season! Thanks! They are great for fall! Great picks. These are so great for fall, this dark hued red s just the right amount of colour for fall without being to over the top. I agree! It is perfect for fall. Thanks! That top for number five is amazing! I need it! Loving that color too! Love the dress from your clothing line! I am loving this color combo for Fall! And that block heel is so pretty! I’ve had these colors on repeat all month! Great choices for fall! Love this color combo, so chic for fall! super cute picks! love them all! Love this! Fall is here :-) I received your fun newsletter email this morning and rocked my oxblood Chole crossbody in honor of fall and you! Hope you and your family are doing great. Hugs! I am loving this color combo! I’m adding a bit of ivory and some leopard, and developing a pretty great “capsule wardrobe” for fall work wear. Love the rich and warm tones! I love all the colors in here! My favorite are the two-tone heels. Perfect for Fall! Loving both pairs of shoes. Also, this is one of my favorite Fall colors! Great picks! Love these picks! That red dress is stunning! Love the dress of your collection!!! This is such a lovely and perfect combination for fall and I love all of the pieces you’ve shared here, Rach, I can’t even choose a favorite! Thanks so much for sharing and I hope you’re having a great week so far, beauty! The checkered loafers are perfect for fall! love this color combo, so many fun pieces!